At The California Endowment, we know that Health Happens when youth are empowered with bravery. That’s why this Martin Luther King, Jr. Day of Service, Lady Gaga’s Born This Way Foundation and The California Endowment’s President Youth Council invited more than 150 emerging youth leaders from The Endowment’s 14 Building Healthy Communities sites across California to the #DREAMBRAVE Youth Summit. The day-long Summit engaged change-makers to support healthy development opportunities in schools, neighborhoods, and with prevention. 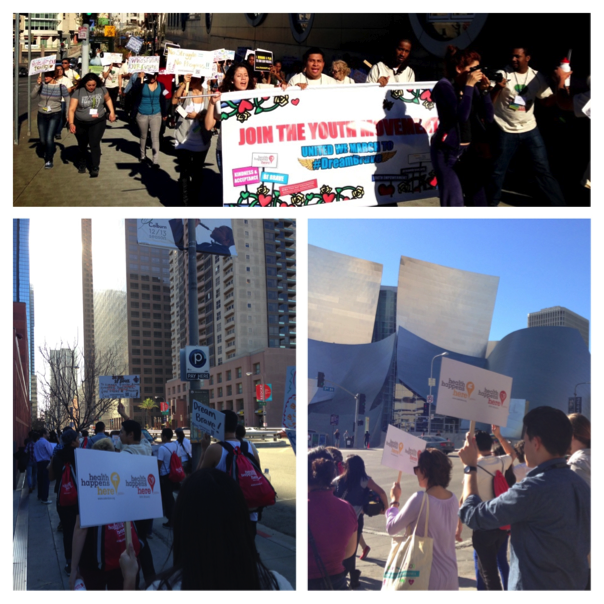 The Summit encouraged youth activism in creating healthier communities where young people thrive. By bringing together young adults who already play an active role in their neighborhoods, the Summit encouraged them to continue to be agents of positive change, fostering deeper awareness of the resources available to help them improve their lives and those around them. Youth Leaders from Coachella joined the #DreamBrave Youth Summit. As part of one of the discussions on action youth can take to help address gun violence, several youth stars from the video, “California Teens Demand a Plan to End Violence” shared their experience in making the viral video, which has been viewed over 1 million times. Youth were also encouraged to sign a Change.org petition committing to helping the president develop effective solutions to ending gun violence. The Summit also presented youth with the opportunity to interact with the Born Brave Bus, which was in front of The California Endowment’s Los Angeles headquarters. The Born Brave Bus joined Lady Gaga on the road for the U.S. leg of her Born This Way Ball Tour, and allows young people to gather and celebrate their individuality in a safe arena. The Born Brave Bus allows young people to gather and celebrate their individuality in a safe arena. California Endowment President and CEO, Dr. Ross and Born This Way Foundation President and Co-Founder (and mother to Lady Gaga), Cynthia Germanotta, took part in all of the day’s activities, including joining students on a 2.5-mile march from The California Endowment’s Los Angeles headquarters to the famed Staples Center. Students carried signs and chanted along the route, making sure the messages of bravery, kindness and self-acceptance rung out in the streets of Los Angeles. Upon reaching the Staples Center, Dr. Ross joined youth at a rally where they presented Cynthia with a photo mural signed by all summit attendees. The photo mural will remain on the Born Brave Bus and continue touring with Lady Gaga across the country. Students marched the streets of Los Angeles for bravery, kindness and self-acceptance. California Endowment President and CEO Dr. Ross joined youth at a rally where they presented Lady Gaga's Mom, Cynthia, with a photo mural signed by all summit attendees. From engaging with fellow youth leaders from across the state, to marching in the name of bravery and acceptance, the #DREAMBRAVE Summit was truly a memorable day that not only energized youth to be catalysts for change, but also set the stage to help make health happen throughout California. The Health Happens with Bravery photo mural will remain on the Born Brave Bus and continue touring with Lady Gaga across the country.